Alisson believes Liverpool must accept nothing less than victory against Manchester United to keep their Premier League title tilt on track. The Reds are the only team still unbeaten in the top-flight, lead Manchester City at the summit by one point and take a five-match winning streak into Sunday's crunch Anfield encounter. 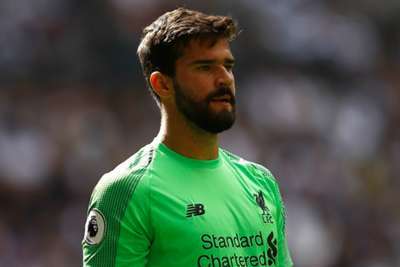 Star goalkeeper Alisson, 26, has been essential to the excellent run of results, living up to his hefty price tag with a succession of clean sheets in his first season since arriving from Roma. The Brazil international made a vital late save in the crucial Champions League victory over Napoli in midweek and is determined to secure three points in his first taste of one of English football's most feted fixtures. "The two clubs I played for previously, Internacional and Roma, had two major derbies so I'm used to derbies and, worldwide, the Liverpool-United rivalry is well known," Alisson told The Times. "We were very familiar with it in Brazil, more aware of it than of the Liverpool and Everton rivalry given the size of the two clubs, but knowing about it and experiencing it are two different things. "I can't wait to experience it and some beautiful football. "It's a really important game in terms of our aspirations to win the title. We need the win. We will have the support to do that and to continue with our excellent trajectory." Liverpool are 16 points clear of sixth-placed United, but are without a victory in any of the past eight Premier League meetings between the pair.